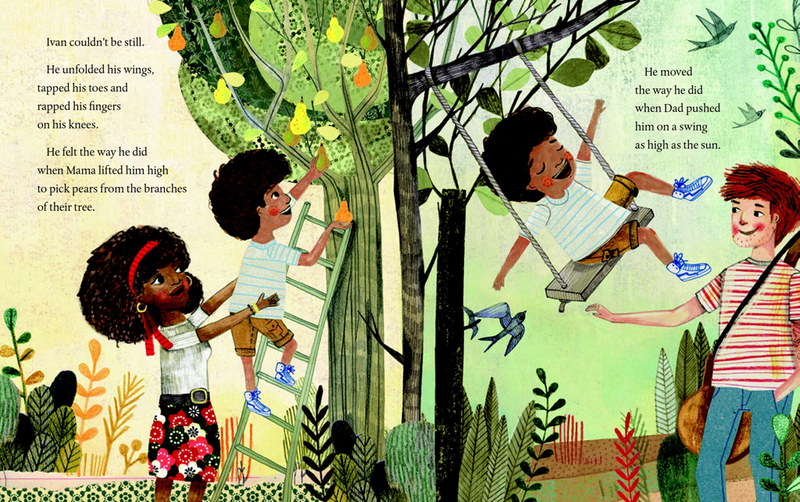 Spring is a good time to explore picture books that celebrate devout Muslim communities and their love of family and faith. May 6, 2019 marks the beginning of Ramadan. Aleeya and her mother live in a small Malaysian village, a kumpung. Their days were filled with simple joys: chickens, kittens, hanging out laundry, watering the vibrant red hibiscus. Indoors, there is quiet time for mommy's daily prayers, Aleeya's crayoned drawings, and stories under the mosquito net. They prepare a variety of tempting dishes and enjoy sharing meals with family and friends. Little Aleeya and Mommy sayang, always together. Insh'Allah, I will always be by your side. When Mommy becomes ill, Aleeya cannot be consoled. She refuses invitations to go out with her aunties, wraps herself tightly in her mother's sarong, and remains fixed in on the stair step. Then she comes to a conclusion: perhaps she can help Mommy by bringing her a beautiful red hibiscus. Over time, Mommy recovers. In good times and in times of uncertainty, the love between the two remains constant. 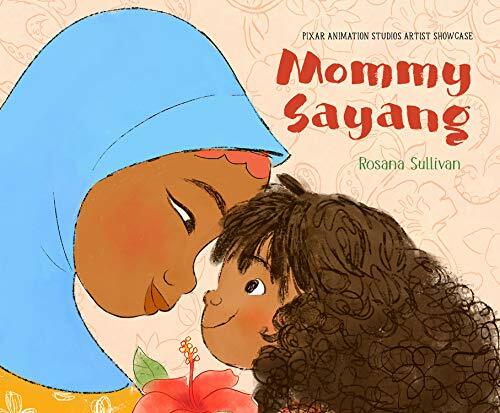 Sullivan’s art is an integral part of Mommy Sayang. Aleeya, Mommy, and other individuals are brightly colored and set against pale backgrounds rendered with a pastel color wash. The exception is the dream sequences. Here the pages explode, filling the entire space with vibrant color and patterns. Aleeya dreams in technicolor. Both faces and body language tell the story: warm embraces, a defiant stomp, a tiny tear. The theme of parental love echoes throughout the pages: a hen with her chicks, a cat nursing her young kittens, several close-up portraits of Mommy and her daughter. Heartwarming story. Beautiful art. Rosana Sullivan is a storyboard artist with Pixar Animation Studios. 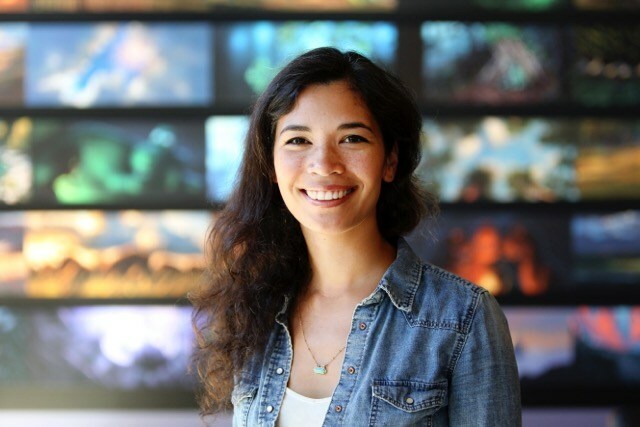 She worked on several Pixar movies including The Good Dinosaur, Coco, and Incredibles 2. 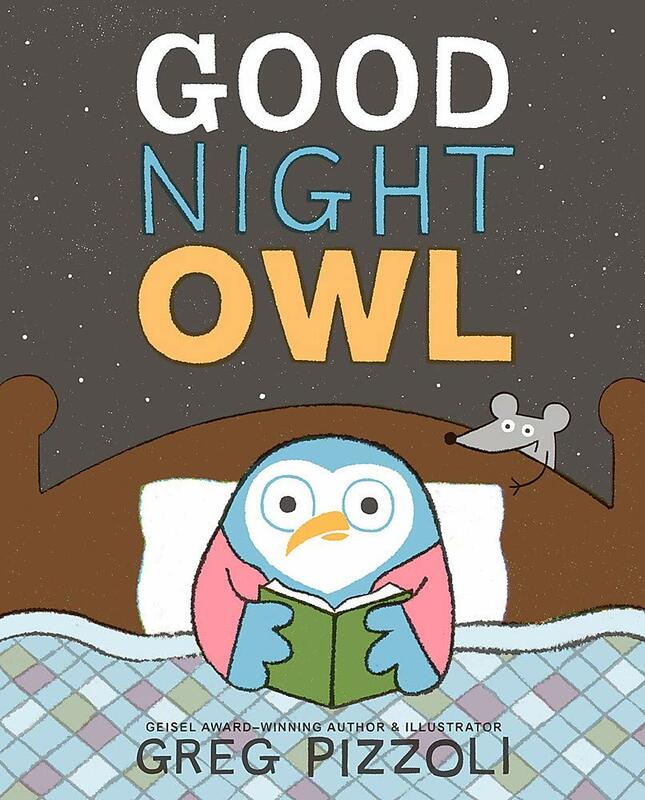 Her picture book is part of Pixar's Artist Showcase series. It's time for Ramadan, a month-long religious holiday honoring the revelation of the first verses in the Quran to the Prophet Muhammad. It is a time for prayer and refection, study of the Quran, and helping the poor. It may be best known as a period of fasting, going without food and drink from sunup to sundown. Sophia is excited as her family prepares to begin observing Ramadan and decides that she will observe the traditional fast. "Count me in!" she joyfully exclaims. She quickly discovers that what sounds wonderful in theory is difficult in practice. She must awake and eat a meal before sunrise, ignore her rumbling tummy, and resist her brother's chocolate chip cookies. To her dismay, the lure of cookies is impossible to resist. An understanding grandmother helps her see that there are other ways that she can participate in this holy celebration. She can observe Ramadan in a manner that is appropriate for a young child. 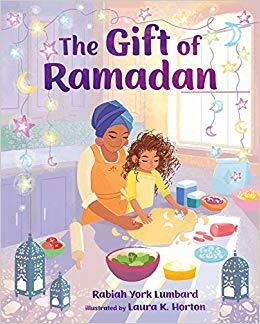 Use The Gift of Ramadan to introduce this religious celebration to young readers. The month is about emptying oneself of all that is selfish, then filling oneself with all that is good, true, and beautiful. 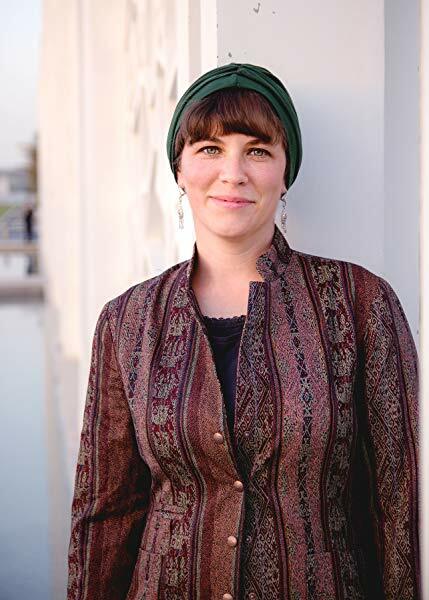 Alexis York Lumbard aka Rabiah York Lumbard is an American Muslim living in Qatar with her husband and three daughters. 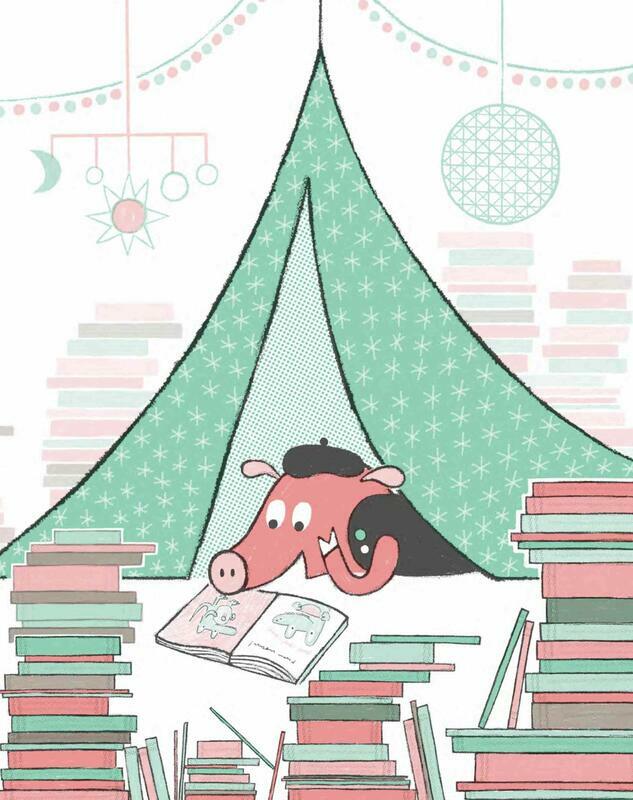 The author of several picture books, she is currently pursuing an advanced degree in creative writing. Laura K. Horton is a freelance illustrator with a degree in illustration & animation from the Milwaukee Institute of Art and Design. 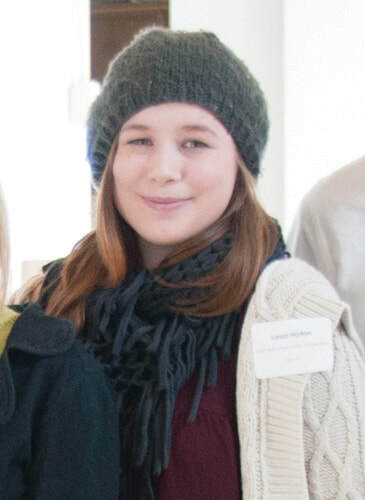 She is currently residing in Finland, working on an advanced degree in game design and production. When you're in sixth grade, life can be difficult. When your mother leaves the family, life can be challenging. When your father suffers with a bipolar disorder, life is a burden that becomes impossible to conceal from others. Fig struggles under the weight of these difficulties. The daughter of a renowned composer and pianist who is no longer able to create music, it is up to Fig to maintain some semblance of order in her home and her life. Her father loves Fig and tries to be a good parent to his daughter. But often his illness prevents him from functioning in the role of care-giver to Fig. She is beyond terrified when her teacher notifies child protective services and a case worker arrives at her home. She knows that there are problems but is desperate to protect her father at all costs. ​She reasons that perhaps she can help her father if she better understands him. A science and math geek, she takes the plunge and enrolls in a painting class. Fig discovers Van Gogh. Drawn both to his work and his life story, she begins to see her father as Van Gogh, the troubled artist and herself as Theo, the supportive brother. Life takes an unexpected turn with the arrival of a new neighbor, Mark. Fig enlists his help when dad goes wandering off during a storm. Over time, the two men develop a romantic relationship. Fig is troubled by her father’s new love interest, as she fears this will destroy their father/daughter dependency. When a violent hurricane strikes, everything comes to a frightening climax. Fig eventually realizes that she can neither solve nor hide her father’s problems. She learns to accept this new man in their lives. She is not alone. She can trust. She can hope. I wept buckets and buckets while reading this. I wept for the little girl, who bravely tries to carry such a tremendous weight on her fragile little shoulders. I wept for the loving father, trying to make his way through the muddle in his mind, wanting desperately to care for his daughter and realizing that he is failing her. This is a story of love in the face of crushing difficulties. Of overcoming fear. Hurricane Season broke my heart and then put the shattered fragments back together in an astonishing way. Chapter titles are the names of well-known Van Gogh paintings. 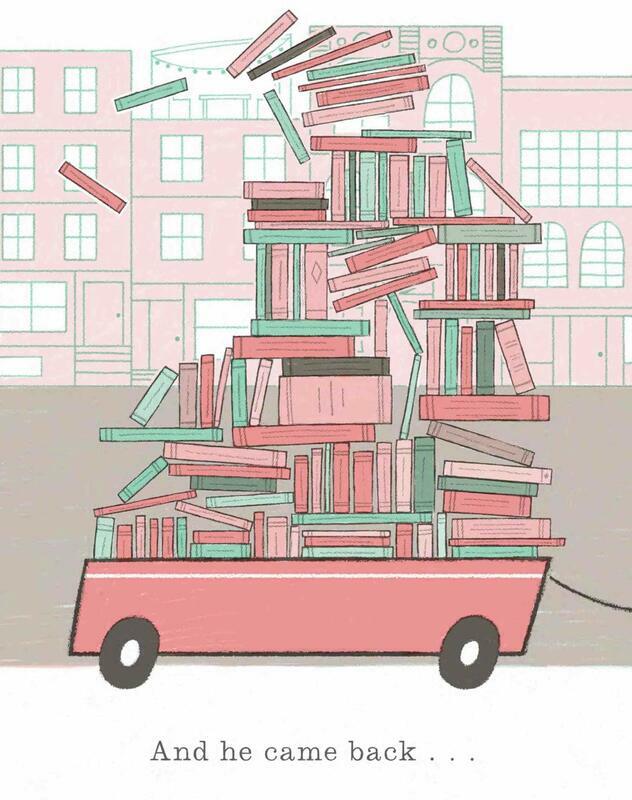 Melleby cleverly weaves each painting's theme into the chapter. For example, the first chapter "The Yellow House" describes a change in the neighborhood, when Ms. Minkle moves out of the small yellow house across the street. 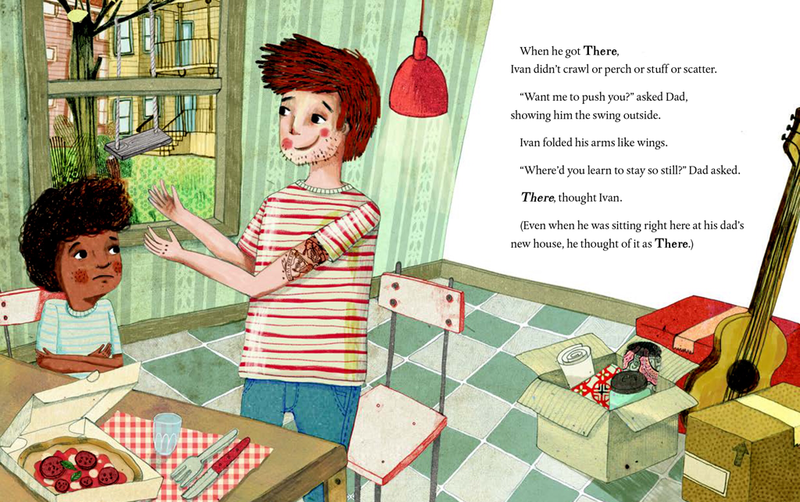 "Three Sunflowers in a Vase" recounts the first time Fig, her dad, and Mark eat dinner together. You don't have to be familiar with Van Gogh's paintings to appreciate the chapter titles. However, after reading the book, I scoured the internet, finding the paintings used as chapter names. 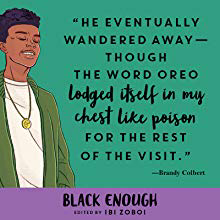 It was interesting to go back and piece together the connections between art and this novel for young readers. For art lovers this touch is brilliant! Vincent and Theo by Deborah Heiligman is a thoughtful study of the van Gogh brothers. 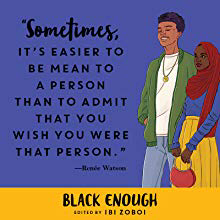 It received numerous awards including 2018 Michael L. Printz Honor Book, 2018 YALSA Excellence in Nonfiction Award, 2017 Nonfiction Boston Globe-Nonfiction Award, and SCBWI 2018 Golden Kite Award for Non-Fiction for Older Readers. Pair Hurricane Season with Vincent and Theo for an excellent fiction/nonfiction reading experience. McTavish's decision to adopt the Peachey family was not the most sensible decision of his life. 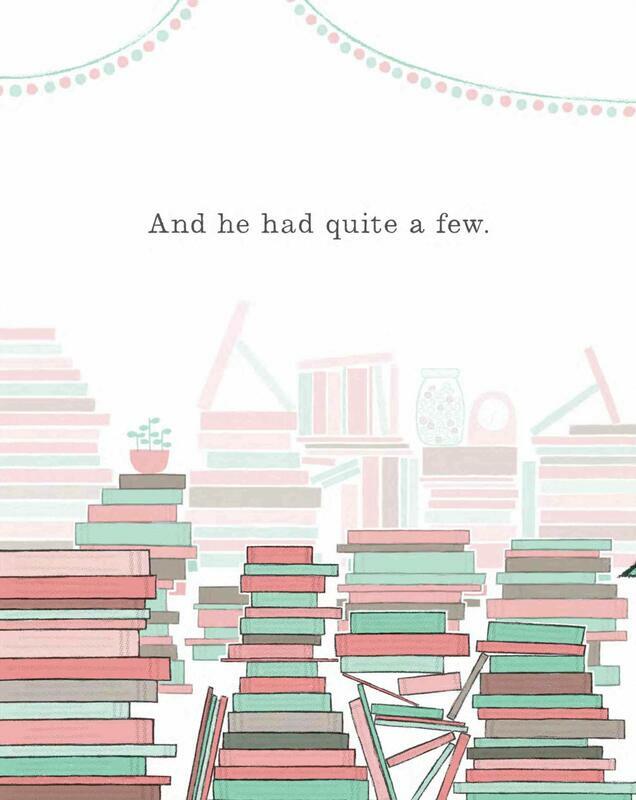 Books that are a delight for adults and young children to read together are a rare breed. 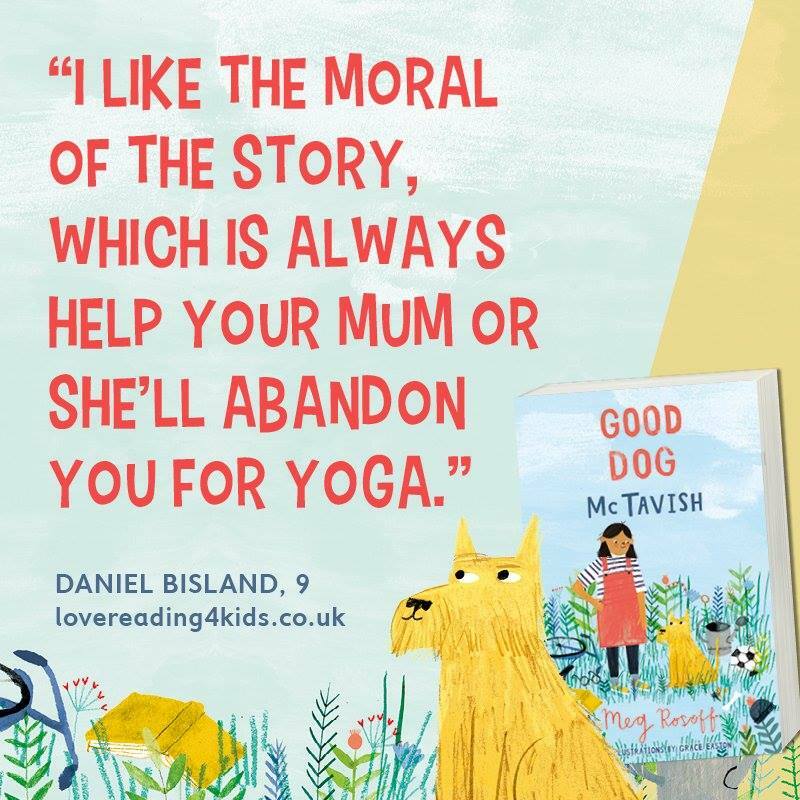 Meg Rosoff has pulled off this feat with Good Dog, McTavish, a story brimming with wit and charm. Rosoff turns the familiar rescue dog trope on its head. McTavish is indeed a dog. But his task is to rescue a family. When he decides to adopt the Peachey family, he knows that this going to take time and a great deal of work. Ma Peachey has announced that she is giving up on being a mother. No more cleaning. No more cooking. No more nagging. Pa Peachey and the three Peachey children are on their own. Needless to say, the entire household is in a state of chaotic disarray. 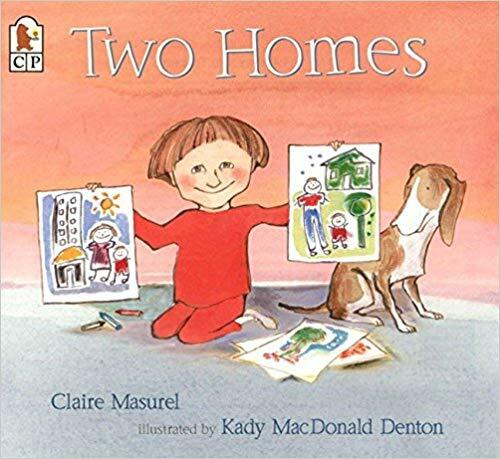 McTavish and eight-year old Betty devise a plan, actually several plans, to restore order to the home. ​Humans were puzzlingly dim. McTavish sighed. There was so much work to do. Youngsters will chortle as McTavish puts his plans into action. 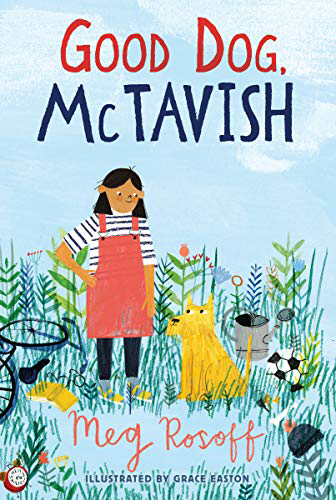 Beginning with the piles of discarded clothing and shoes scattered throughout the house, McTavish systematically trains the family to clean up, pick up, be punctual, and feed themselves. The ongoing efforts of the father and his children are interspersed with descriptions of Ma Peachey, intoning "ohhhmmm" while executing near-perfect looping cobra and dancing warrior yoga poses. When the family takes ownership of the home and contribute to its order, Ma quietly rejoins the family. Humans make excellent pets, he thought. When you took on a rescue family, it often took some weeks for them to settle, but he was glad he'd decided to adopt the Peacheys. 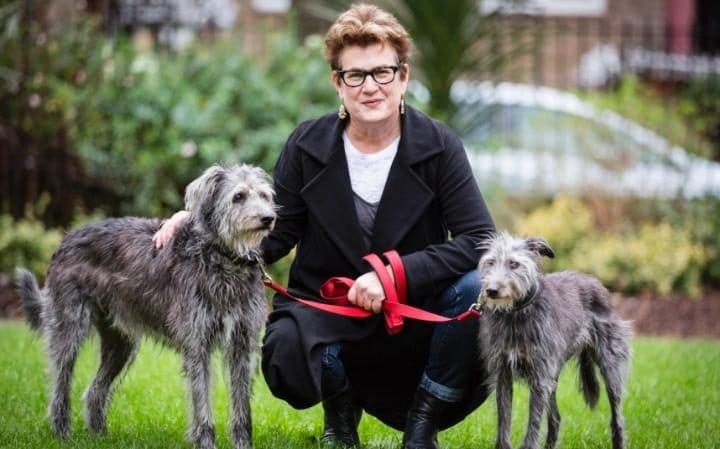 Meg Rosoff is the author of Guardian Children's Prize and Michael L. Printz award-winning How I Live Now and National Honor Book finalist recognition for Picture Me Gone. She also received the 2016 Astrid Lindgren Memorial Award. With Good Dog, McTavish, readers can enjoy another side of Rosoff. Her sparkling writing with clever asides is tailor-made for entertaining family reading. 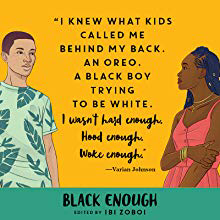 Enjoy this brief interview with the author. 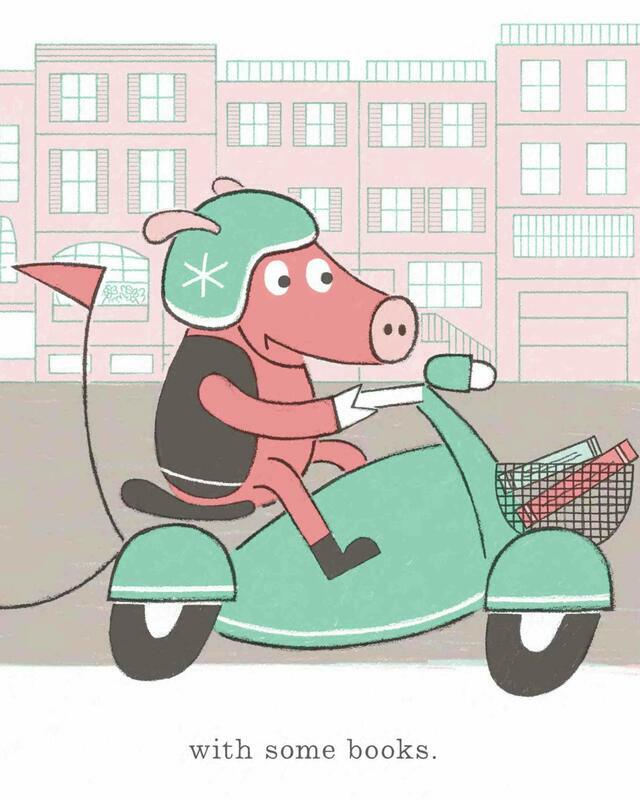 Grace Easton's illustrations add a fine touch of whimsy. Love the details. Of special note is McTavish's eye roll. It speaks volumes. Easton's portfolio is a visual delight. I could spend hours perusing her plush collection with inventive packaging and children's clothing tie-ins. Meet dad. Meet the family cat. Dad and cat are alike in many ways. Both have fluffy yellow hair, enjoy a tasty meal followed by a nap, even have similar fears. They make a great pair. 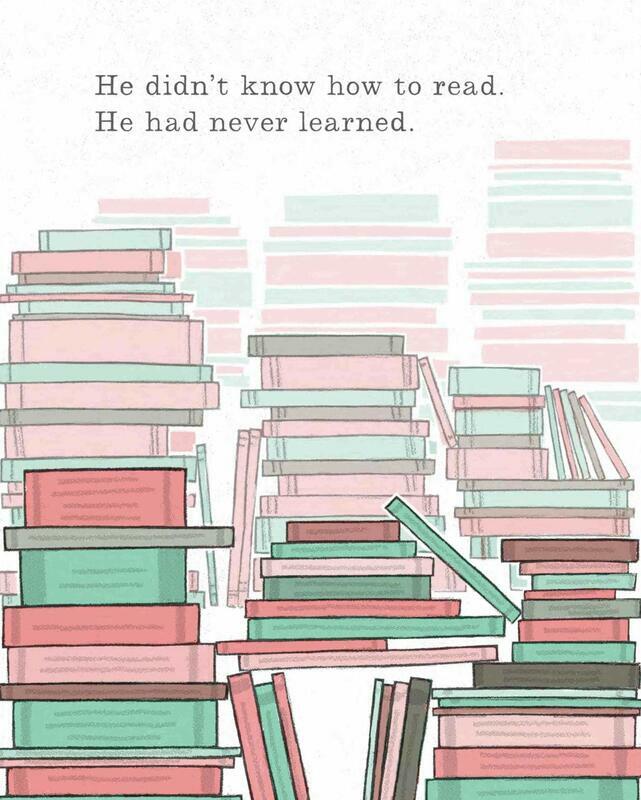 ​But that’s just the beginning. 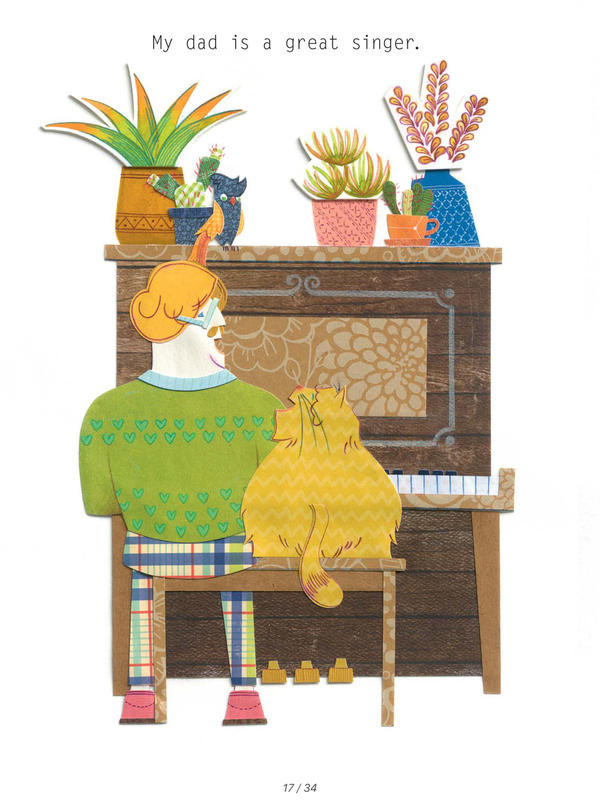 ​The real story on these pages goes beyond a charming tale of a man and his cat. Readers wonder about the family member narrating the story. Who can it be? The storyteller's identity is discovered by carefully examining the illustrations. 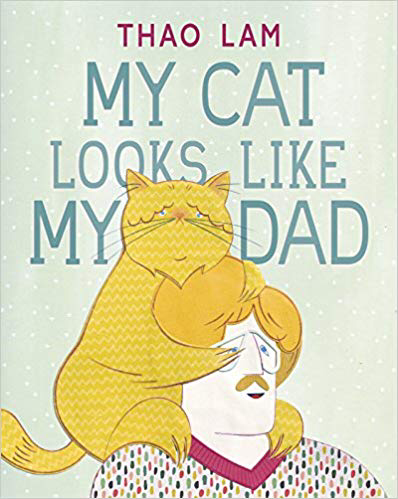 Observant readers will recognize that there is more to this family than a man and his cat. There will come an "ah ha" moment when it is obvious that the narrator i.e. additional family member is a bird! That's right. The bird refers to its sibling as "my cat." Clever. Clever indeed. The complete family portrait with dad, mom, cat, and bird graces the final page. Thao Lam's cut paper collages are a delight. The title page, featuring a strip of photobooth headshots of feline and human playing around with spectacles is a great introduction to the characters. 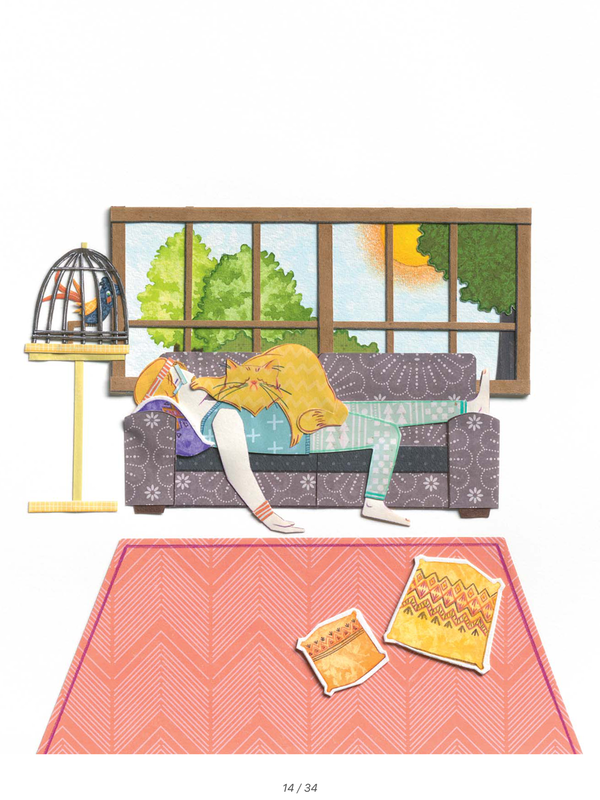 Her illustrations poke fun at quintessential stereotypes such as discarded socks on the floor and milk mustaches. The cat's facial expressions are priceless! Greeting the day with graceful tai chi. Crooning tunes at the keyboard. Snoozing: Nap time is lap time. My Cat Looks Like My Dad offers the subtle message that families come in all shapes and sizes and can consist on a variety of members. Readers will also need to put aside the assumptions that only certain individuals, or species, can cohabit peacefully. 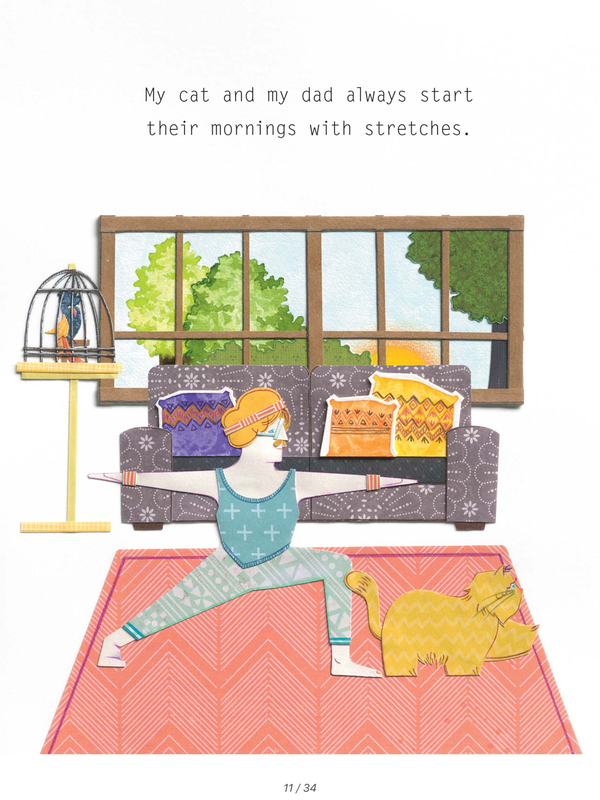 Meet Thao Lam and learn about the inspiration for this book. View her creation process. 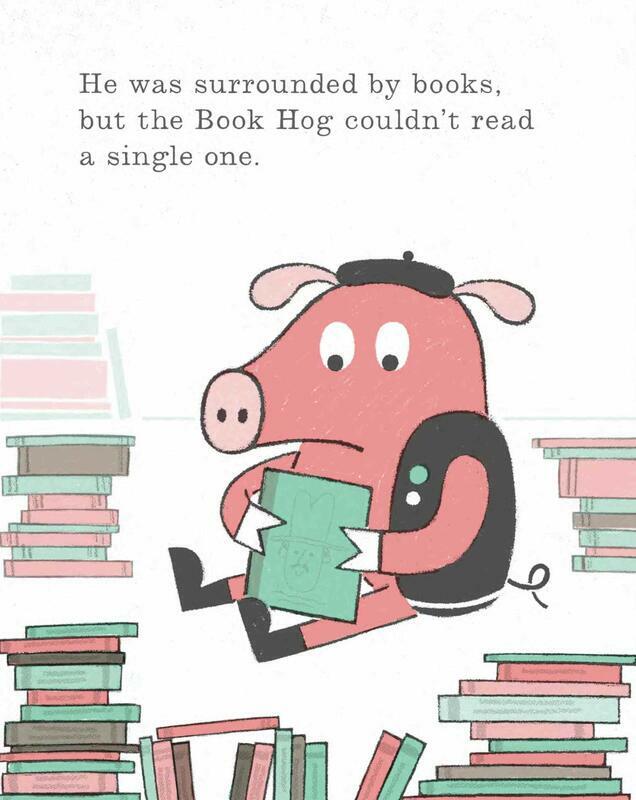 Share the book and video with students. An interesting extension activity would be to provide kids with a selection of patterned papers and other art materials. Then invite them to create a portrait collage of their own family. Meet Carl, the lowly earthworm. Each day he toils, tunneling through the heavy ground and decaying detritus, leaving in his wake enriched and aerate soil. Until the field mouse asks him, "Why do you do that?" He goes in search of an answer to the mouse's question. He queries rabbit who is tending her babies, fox who is hunting for dinner, and squirrel who is planting tree. 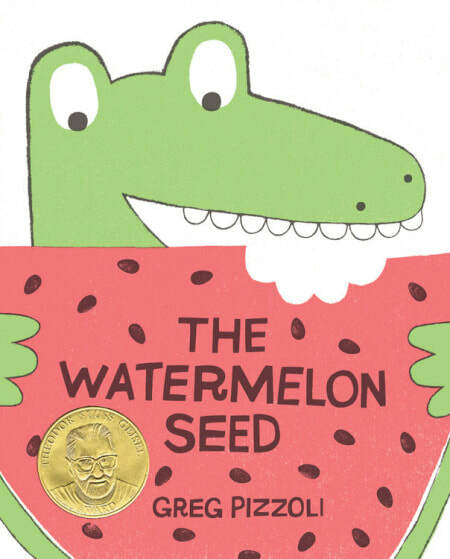 Each animal is too concerned with personal tasks to consider Carl's inquiry. Meanwhile, the ground has become hard, dry and barren. What has happened? Freedman's signature watercolors are the perfect match for the story. Landscapes above and below ground are breathtakingly beautiful. She is a master of the watercolor wash. While all the animals are endearing, it is Carl who steals the show. More than his expressive face, it's his body language. Who knew that a worm could have body language? 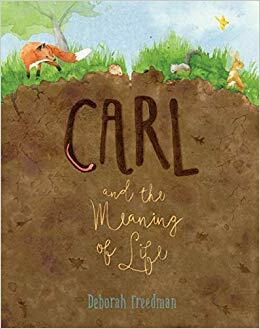 Carl and the Meaning of Life is more than a gentle environment, ecology and food chain tutorial. It is a thoughtful exploration of an individual contribution to the larger community. Sometimes you have to go back to the past to move forward to the future. Kat, skilled in the art of Brazilian jujitsu, is brutally assaulted in her school’s stairwell by a popular member of the basketball team. She escapes, but the incident has scarred her, leaving her wary of men and emotionally shattered. When she reports the assault, her attacker pleads a convincing defense, denying her accusation. School becomes unbearable due to the constant presence of her assailant as well as the questioning looks and snide remarks from fellow students. A family friend arranges for her to leave her California home and live with an understanding friend in Boston. Robin, the adopted son of wealthy, well-connected Boston parents, is completing his high school senior year. His father plans his life trajectory beginning with a college education. Robin feels unsure and unsettled, with questions regarding his birth and subsequent adoption. Guess everyone has a backstory. ​They make us real, even if they make us cry. Kat and Robin meet at a Boston church youth group. They are invited to spend the summer in Kolkata. working with an organization that fights human trafficking and rescues young children. Both teens have their own reasons for deciding to go to Kolkata. ​Through alternating voices, Kat and Robin share their hopes for this summer of service in India. How much of himself would remain if he could press REWIND and start life again? Robin was born in Kolkata and longs to meet his birth mother and understand his history. Kat is struggling to overcome a traumatic assault. She reasons that teaching young girls to defend themselves will help heal her anguish and calm her fears. Interestingly, neither accomplishes his/her stated purpose for traveling to Kolkata. However, each finds the summer in India to be a turning point in their lives. Perkins builds the story to a heart-pounding, potentially terrifying climax that will keep readers swiftly turning pages. The conclusion is open-ended, bittersweet yet satisfying. This search for identity and recovery is a sweeping saga that explores the serious problem of international human trafficking. Gripping storytelling, eye-opening adventure in a faraway city, Forward Me Back to You packs an emotional gut punch that lingers long after the final page. A story not to be missed. ​When people I love are out of reach, I offer some kindness to another that I can’t give my dear ones. It brings peace to me. There is a lovely scene where the Asha House residents surprise one of the volunteers with a birthday cake. In turn, each girl feeds the honoree a piece of cake, while telling her something they admire about her. I like this tradition and will continue it by sharing some virtual bites of cake with Ms. Perkins. Superheroes.There are numerous references to superheroes. Both Robin and Kat are superhero movie afficianados and often reference specific heroes. Kat describes Robin's quest as “Kal-El's search for the planet Krypton." Both Robin and Kat develop qualities (superpowers) that they never would have dreamed possible. ​Too many villains. Not enough heroes. The real world’s nothing like the movies. Animal names. Kat works at the local zoo and is conversant in animal taxinomany. She secretly refers to individuals by a specific animal species. The dignified Mrs. Vee is Ibis. Host of the home where she initially stays is Hyena man. Robin is Bird Boy. Her attacker is a wolf. Kolkata. Perkins paints vivid pictures of life in this fascinating city, from the grandeur of Victoria Memorial and the noble work at Mother House to the seamy underbelly of the city where innocent young girls are captured and exploited. Urban sights and sounds are everywhere: rickshaws, drenching rain showers, and cardamom-spiced chai. 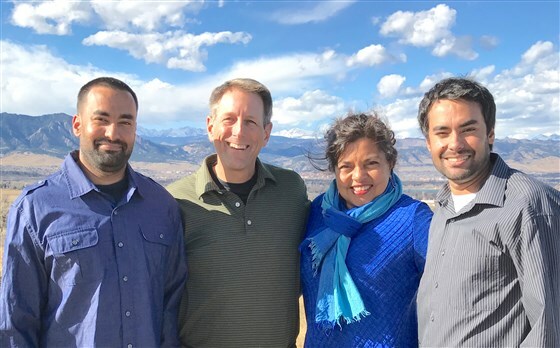 Mitali Perkins, mother of adopted twin brothers, shares her perspective on adoption and the adoption triad: birth mother, child, and adoptive parents. Read her Huffpost opinion piece and her recent interview with Lakshmi Gandhi in an NBC news report. Ivan loves music, all kinds of music. He is especially drawn to the melodic chirps, calls, and trills of birds in his backyard. Up in the branches of the pear tree, he coaxes the winged creatures with bird seed, identifying various neighborhood birds by the sounds that each species makes. Then something happens which disrupts his childhood and causes Ivan’s life to undergo a radical change. Dad moves out and into a new place. Ivan distinguishes the two dwellings by referring to the familiar home with mom as here. Dad’s new residence is there. Smith emphasizes the distinction Ivan makes between the two homes with the words here and there in bold face type. Over there at his father’s house, things are not the same. No pear tree. No customary surroundings. No mother. Ivan remains sullen and silent. He can't seem to successfully transition from the home of his early childhood to a different living arrangement with his father. His relationship with dad remains at an impasse until his father begins to strum his guitar. Ivan is drawn to the welcome sound this music. When he responds to the tune, dad invites Ivan to create lyrics for his composition. Ivan thinks about it. Inspiration strikes. He knows what to do: fit the sounds of his winged friends into his father’s melody. Working together, a new song is born. Combining his love for music and for birds, Ivan and his parents forge a connection that will help Ivan bridge the two distinct worlds of mom and dad. Climbing the pear tree in mom’s spacious backyard is different from a swing attached to a tree limb in dad’s small fenced-in outdoor space. Ivan can belong in each space. 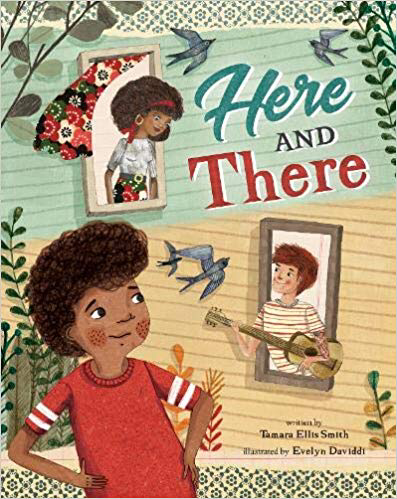 While it isn't always so easy in real life, Here and There offers youngsters and their caregivers an exploration of ways to help children cope with parental separation. 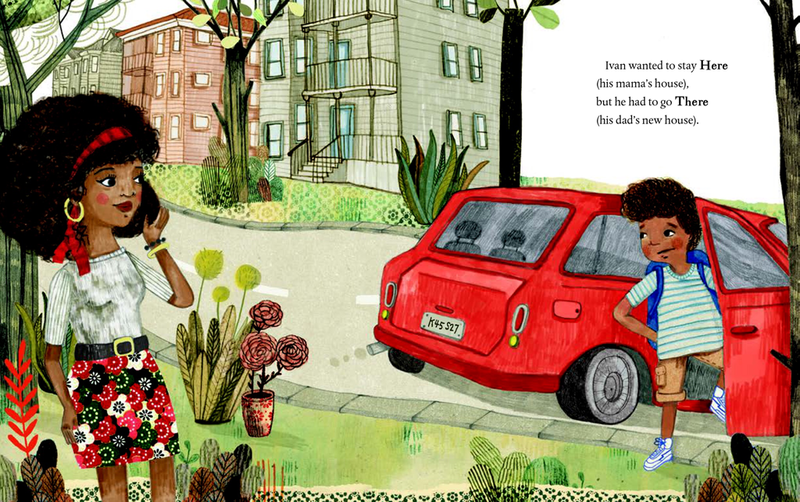 Italian artist Daviddi captures the contrast between the two homes of this biracial child. Mom in her fashionable attire serving milk and cookies contracts with dad sporting facial stubble ordering take-out pizza. Birds flit in both environments, creating a unifying theme of music and nature in two separate homes. 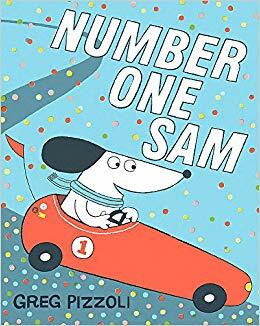 Looking for additional picture books to help youngsters cope with family separation and divorce? 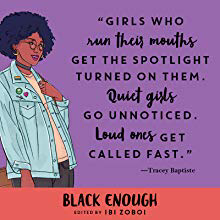 Try these books. 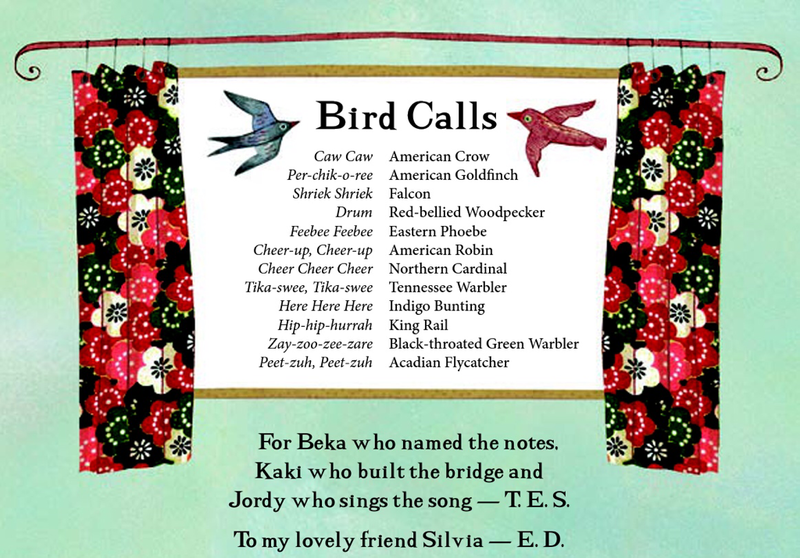 A small chart listing a few familiar bird calls can be found at the back of the book. ​Listen to the recorded bird calls. How many can you identify?